UPDATE: These babies are up for sale! Alright so here is the final product and after some function testing I'm happy with the results. There are a few more things to do before the next update and before they ultimately go up for sale. First I've got some black oxide Chicago screws with slotted posts and Phillips heads on them coming my direction so the version that goes on sale will include those rather than these shiny units. 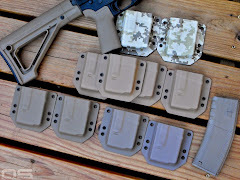 I also intend to get my hands on some .080 Kydex for the final product only because I think that people will want thicker material - feedback is welcomed and encouraged. 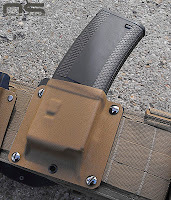 I personally think the .060 is sufficiently robust and I also think that the flex associated with it is among the benefits of Kydex, but I'm interested to see if .080 strikes a good balance between strength and flexibility. So let's get down to the important stuff. 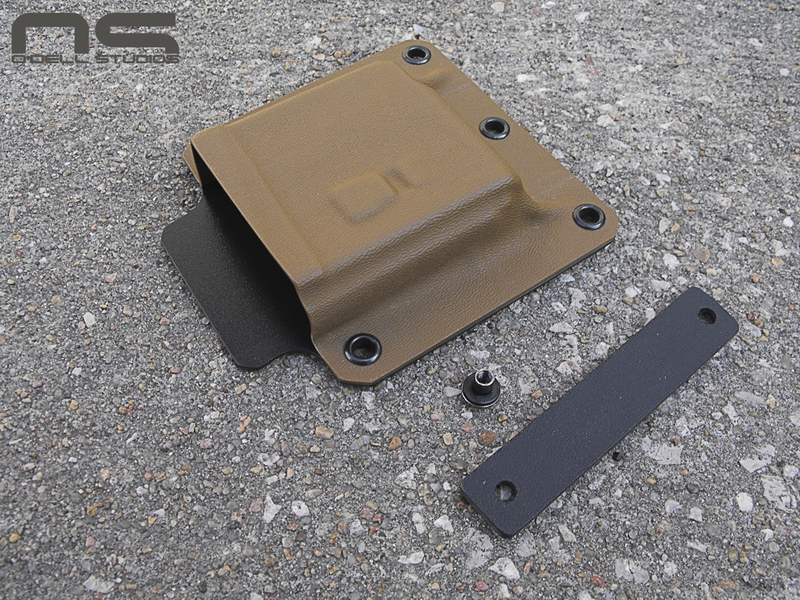 The width of the carrier is 4.25 inches and ends up just a hair under that after sanding and edge finishing. This means that it falls precisely between 3 columns of MOLLE webbing as you can see to the left. The back is flat and with these flat mounting strips the pouches are as tight to the body as humanly possible - you may be able to see the offset difference between the old carrier and the new one in the image to the left. I will be experimenting with offset loops that will cant the pouch away from the body slightly. 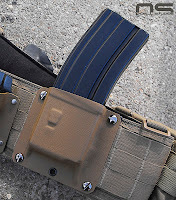 This is something I personally would want, as it gives me a little more room for error when grabbing the mag and for someone wearing more gear it adds some extra clearance. Retention came out solid. 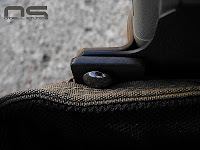 With a pound of ammunition packed into a 30 rounder and much of the magazine exposed, you don't want something ripping it out. 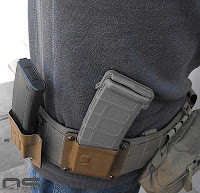 Before all this gun-control nonsense began I should have purchased a Lancer and TangoDown magazine to test but I feel confident based on images of the mag catch indention and tab, that they will work fine. 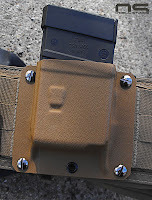 Magazine retention is slightly increased once the carrier is mounted as well. Because I designed the pouch to fit right inside 3 columns of webbing there is absolutely no movement what-so-ever. 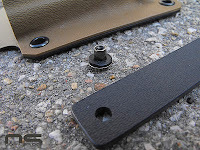 Once the screws are tightened the unit cannot shift in any direction at all. It is locked in. 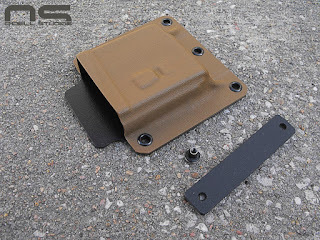 In the image to the left you can see that you have access to the mounting hardware front and back so that it is easily tightened and maintained and extremely easy to mount. 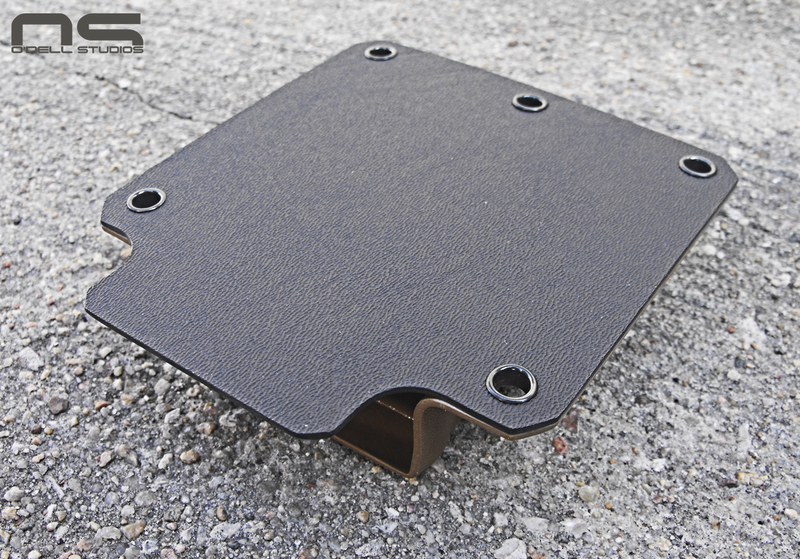 Mounting strips are .125 thick Kydex and .75 inches wide. 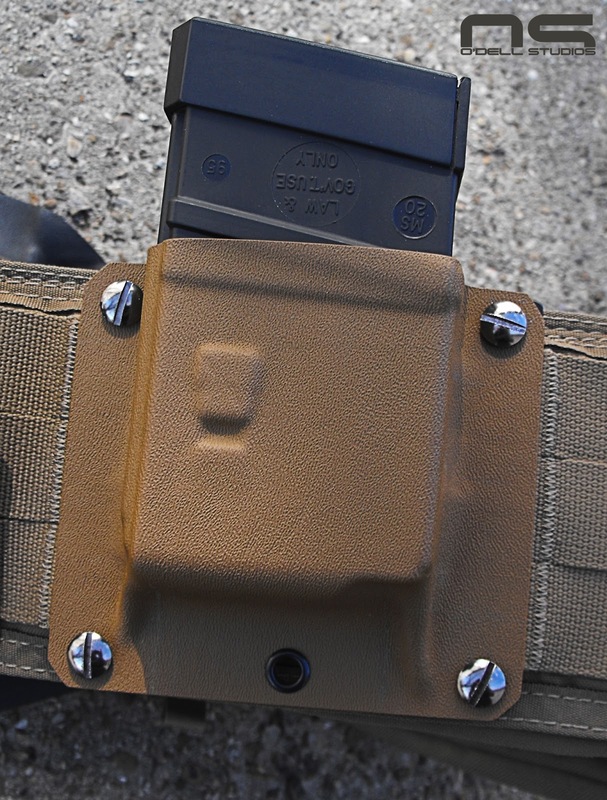 I include the relief cut on the back half of the carrier because I found that if I were to simply angle it off, it interferes with your first finger as you insert a magazine. Furthermore it creates a shelf where your thumb and first finger make contact as an indexing point for drawing the magazine. As you bring it to the gun your hand is correctly placed so that your fingers do not interfere with the reload. 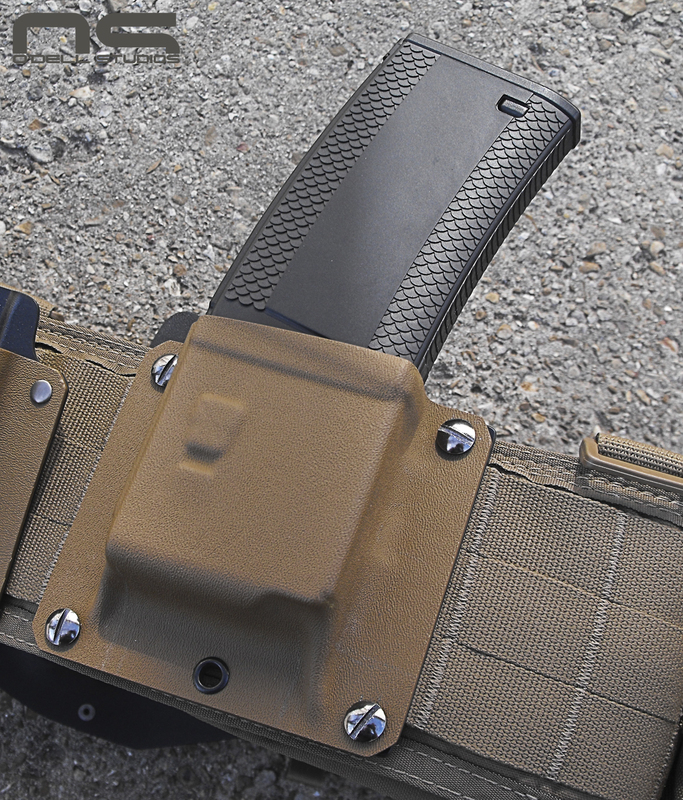 Here are some common magazines ridding in my Gen II Kydex Rifle Magazine Carrier. It is important to note that this design is strictly bullets rearward and does not function with a bullets forward orientation. 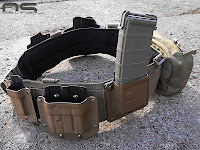 However, this carrier works very well with all of these magazines and these images demonstrate how the carrier rides on a Battle Belt or War Belt style rig. I have also begun experimenting with a pants belt loop design that can be flipped for high or lower ride carry. I will definitely offer 1.5 and 1.75 inch pants belt loops which will use the same mounting holes. Because these carriers are now so simple to mount, budget minded buyers will be able to simply buy loops that allow them to use the carriers in various ways. I feel like this design meets my personal goals for this project overall. Some small details pictured here. Chicago Screws will come with rubber o-rings because I have found that they help tremendously with getting the screws tight and keeping them that way. They are sort of a second line of security when combined with blue Loctite. And finally a shot of it on the body. With the flat mounting strips the magazine touches the body. It is as low profile as it can possibly be and could easily be worn under a jacket. I think there are two schools of thought here and an offset style mount will be available as I iron out exactly how it should be made. I have a couple color combinations that I really want to try out and offer, but I may only offer a limited number of colors. I personally don't see the point in black but I use it just to shave some cost off each unit and because the back isn't really seen. Somehow it seems a waste to use coyote for both sides. 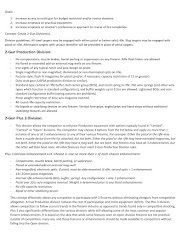 Comments and feedback are welcomed and encouraged, especially on topics like color choices, mounting systems, and material thickness. Thanks for taking the time to look and stay tuned as they go up for sale.